Raul’s Auto Repair Covina is an affordable smog check Star Station. If quality and affordable vehicle service and smog check prices is what you looking for the you have found it. 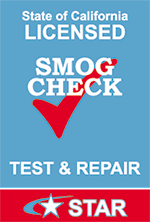 If you car does not pass we can do the necessary repairs to get your smog check approved. So bring in your Car to Raul’s Auto Repair Covina today! – Smog Test Done Fast!